You just received your dental implants in Long Island City to replace your missing teeth and your smile is already looking fuller, better, and healthier than before. However, it is paramount that you are able to maintain these new teeth well into the future for your oral health. Read on to find out how to take care of your implants, if the care routine is different from cleaning natural teeth, and what your next steps should be to keep your new smile healthy! Dental implants can last decades if they are maintained properly. Caring for your implants on a day-today basis is relatively similar to how you should care for your natural teeth. Restored dental implants need to be kept clean of plaque and bacteria twice a day by brushing. Also, any plaque or debris must be cleaned from in between the restorations once a day using dental floss. What Items Do I Need to Care for My Implants? A small, soft bristled toothbrush for twice a day cleaning that won’t be harmful to your implant and restoration. Toothpaste used for brushing that has very low abrasion and tartar control. This will ensure your restored implants are being cleaned without damaging them, as well as controlling the amount of tartar that is formed by plaque. Dental floss to clean around the implants. 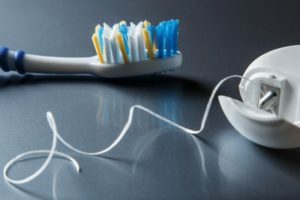 As stated above, flossing is vital to the upkeep of your implants because it cleans out any plaque that could form into tartar in between the implants and their restorations. How Much Commitment is Required in Caring for My Implants? The importance of your commitment towards maintaining healthy dental implants cannot be understated. Dental implants are made to last for decades, but that’s only if you have a strong enough commitment to keeping them healthy. You not only have a duty to maintain daily oral health care as discussed above, but you must also be dedicated to regular visits to the dentist. It is recommended that you see your dentist every 3 to 6 months for a professional exam and cleaning. Your implants will be examined with an X-ray, as well as cleaned to make sure they stay healthy and look great! Dental implants restore smiles and confidence daily, but how long they last is up to you. Follow our tips on how to care for your implants and restorations to get the most out of your new smile. At Long Island City Dental Associates, we have 5 doctors on staff with 2 of them specializing in dental implants. Dr. Saran and Dr. Bizzell have completed additional training in implant dentistry, which makes them proficient in tooth replacement. Dr. Bizzell is a Diplomate of the American Board of Periodontology, which recognizes him as an expert on periodontics and dental implants. They offer surgical dental implant placement and restoration in one office and can be contacted by phone at (718) 530-6539 with any questions you may have.